I heard hundreds of stories – stories both beautiful and barbaric – while treating war-wounded patients from Syria during my first assignment with MSF in Jordan. This story ought to be told. It is about Zehra,* an 8-year-old girl who told me her story with crayons and sketch pens because it was too painful to narrate. The first picture she drew was a sun that has turned red, about to be snuffed out by darkness. Zehra lived in a village in Homs, Syria, in a small house with her father, mother and three siblings. It was surrounded by picturesque mountains, green valleys, with a stream flowing nearby. The sunrise brought life to the valley and the sunsets were magical. Zehra and her elder sister, Dania, used to play outside their house by the stream every day. But every now and then they would hear airstrikes and rush inside for safety. 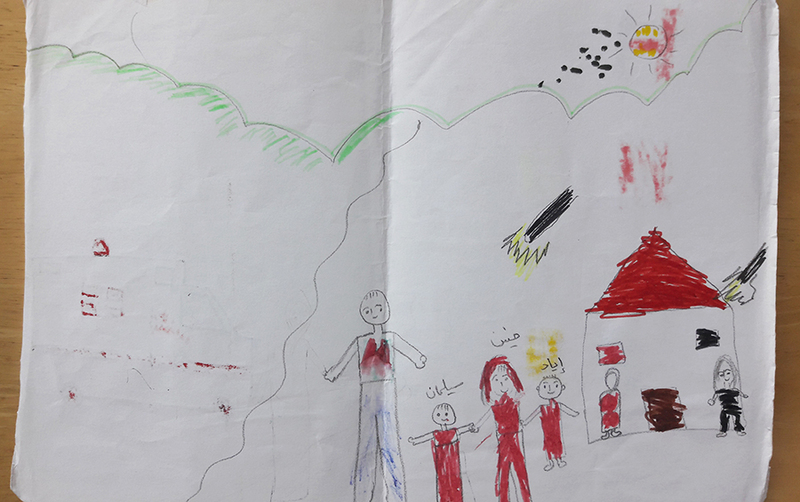 On an otherwise normal day in June last year, Zehra and her sister were playing when the airstrikes started. Scared, she asked her sister to go inside with her. But when her sister refused, Zehra said, “go die, I am going inside”. As she was going inside, two bombs fell near the house. Zehra was thrown inside by the impact and lost consciousness. The next thing she remembers is being covered in blood. Her right leg was crushed. Her mother, eight months pregnant, was lying unconscious on the other side of the house. She had to crawl outside the door to see her sister. She tried to wake Dania, but she didn’t stir. Battling excruciating pain, she dragged herself to her brother, Ashraf. He too was covered in blood. She then crawled to her father who was still breathing, but had injured his chest and spine and couldn’t move. The second picture showed what she remembers seeing after regaining consciousness again. 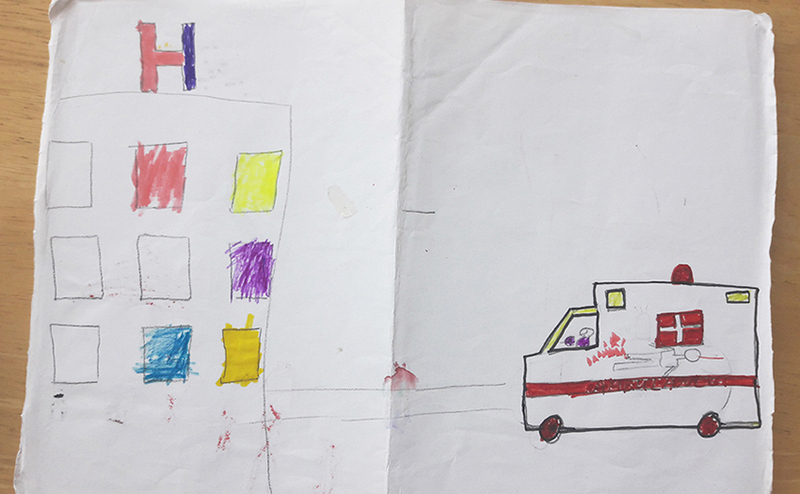 She was in an ambulance, being brought to MSF’s facility in Jordan with her mother. Unfortunately, neither Zehra’s father nor her siblings Ashraf and Dania survived the airstrike. Her last words to Dania haunt her to this day. Zehra had to undergo a below-knee amputation and multiple surgeries to remove the shrapnel that had pierced her face, chest and leg. She got her artificial leg a week before I left. Her mother delivered a healthy boy, who is now two-months old. 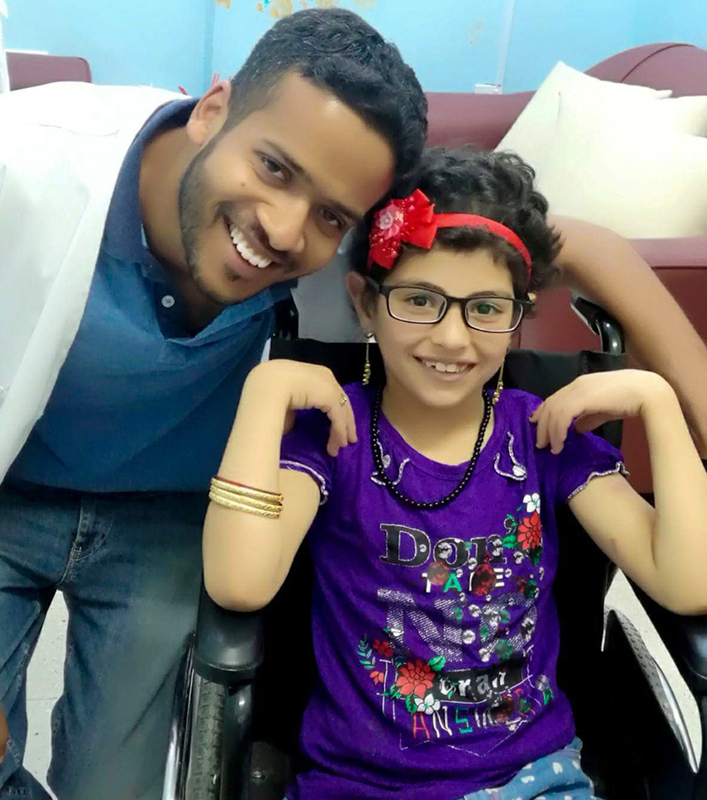 On days when Zehra is happy, her smile can light up the entire hospital. She can talk for hours and hours, and play with total abandon. But there are also days when she suddenly goes quiet, or starts crying inconsolably. She talks to you as if she is a mature 20-year-old. It’s during moments like this that I realise the war didn’t just take away her home and family; it robbed her of her childhood. Through surgery and counselling, MSF tries to give something back to Zehra and others like her, and I feel proud to have been a part of it in a small way. I’ve finished my posting in Jordan now. It was my first time treating war injuries, but managing complicated wounds proved much easier than saying goodbye.